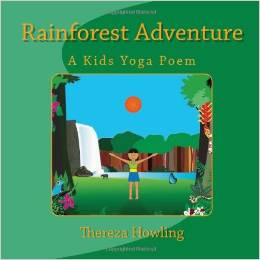 Book Synopsis: The Rainforest Adventure book was created with the intention of sharing some of the good things that happened during Kids Yoga classes. Much like lessons at school or homeschool, we can adapt yoga poses to any theme we would like. The theme for this book is presented in the form of a poem to keep up with the attention span of the younger kids while also showing older kids that poems can be quite interesting, full of action and color, and ready to come alive! By doing the poses illustrated next to the verses, we can make this little adventure turn into reality, and learn in a fun way. What I like about this book: Thereza Howling has written a book that teaches children about yoga postures that will help them learn to better focus, tune into feelings and sensations, release stress, and encourage imagination. She has used a rainforest theme and cleverly adapted yoga poses to showcase its many wonders: a tree, waterfall, monkey, snake, lizard, parrot, butterfly, and dolphin. The text is simple, fun and engaging. The double-page spread has a specific pose with instructions on the left side of the page. The right side of the page has colorful and lively illustrations that relate to each pose. This is a very creative effort by the author and illustrator. A portion of the proceeds for the book will go to the Rainforest Alliance, an organization committed to help rainforests all around the world. Resources: The first page of the book explains how to use the book in a safe way. The end pages offer more ways to use this book that encourage creativity and imagination. There are two sets of eight yoga memory pose cards. Visit Thereza Howling’s website for more ideas for poses within the poems and other activities related to the book. The author is a certified yoga instructor and teaches children, teens and adults in Washington State. Posted on July 18, 2014 by Patricia Tilton •	This entry was posted in Children's Book Review, Thereza Howling, Yoga for Children and tagged Imagination, Rainforest, Yoga. Bookmark the permalink. What a great idea – pairing poetry and yoga (and nature). I loved doing yoga with the kids in my class when I was a teacher. It truly does calm them and help with focus. I would’ve love this book in my classroom. Yes, I thought pairing poetry with yoga and nature was a wonderful idea. Glad to know teachers use yoga in their classes. They didn’t when my daughter was in school. Yoga teaches children so many important tools. Yes, it is a clever book for teachers and parents who homeschool. Yoga is a great way to teach kids to calm themselves. I agree this is such a great idea. Nice way to empower kids! Beautiful way to empower kids. Thanks for stopping. Yoga and rain forests ~ what a lovely combination. It’s a soothing combination. And, thank you for tweet. It is a lovely book that combines many fun elements for kids. What a unique idea! A super book for the classroom! Thanks for sharing! It is a unique idea for a children’s book. Glad you enjoyed the review. Another great book to add to my must read pile – I think this would be awesome for a Rainforest Story Time! Thanks! And, I know you’d be creative with the theme! Thank you so much for reviewing my book, Pat! And thanks everyone for such kind comments. Please let me know if you read it to kids and the feedback you get. I have presented it in a few workshops in yoga studios and also to a 2nd grade class, and it has been well received. That memory game at the end is a hit, I tell you! I appreciate your stopping by Thereza and leaving a comment. I’m glad you liked the review. Good to hear it is being received so well in classrooms. The memory game really encourages imagination and I can understand why it is a hit among the kids. Yes, it is a great beginning book for children. Helps them learn to calm themselves.